1st PLACE - - Art Category - BORIS NOVAK - UTRECHT, NETHERLANDS. 02 October 2016 View it online! The Australian Art Competition Art Toppling Tobacco juried by Jilly Gibson, Mayor of North Sydney, and Dr Martin Williams Lecturer, Communication Studies Group, Faculty of Arts & Social Sciences, University of Technology, Sydney Australia, has chosen my submitted digital painting " Smoking is Suicide" , inspired by an image of a boy with the gun, as the first place winner of the art category in this international competition 2013. A commanding entry which immediately grabs your attention and literally delivers the message at bullet speed. While the image will resonate with boys and young men, it also reaches a broader audience with the global issues of gun violence, corruption and death. The reference to pop art reinforces the notion that cigarettes and guns are part of a global consumer culture which are literally killing a new generation of young men. The smoking gun suggests it is just a matter of time as we stand by passively and watch. A powerful, yet simple message and a truly deserving winner. Prize: 3 top winners are selected for the prize money. 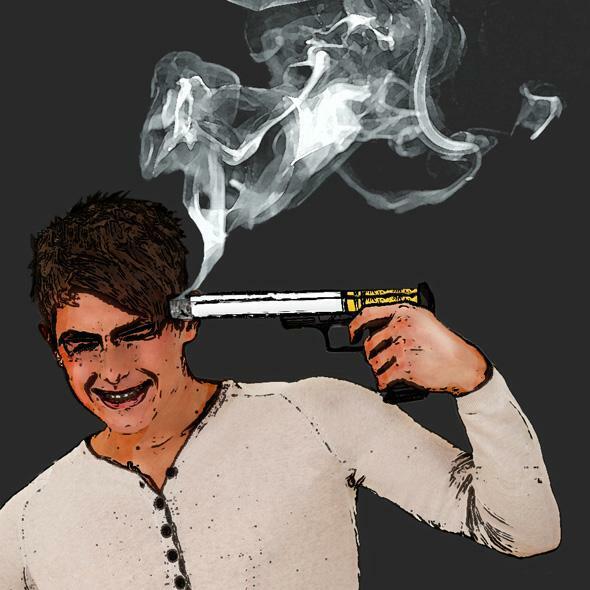 I got inspired by the photo of a boy laughing and posing with the gun, pretending he's committing a suicide. Contradiction in it made me think of how light minded we are in our young age, playing and trying things which can be damaging or even lethal one of them is the tobacco. The Grand Final will now be held on World No Tobacco Day , 2015 , when the finalists from 2010 to 2014 go into the judging. It is hoped that in later years chosen art from the site will be displayed in public spaces--- maybe Sydney Opera House. Lecturer, Communication Studies Group, Faculty of Arts & Social Sciences, UTS. A small tatty WW1 photograph landed in my box, leaving me with a tangle of emotions. It was of a group of Australian soldiers so many of them with cigarettes that were free rations. One of these men was my beloved father and I felt sad and mad as I recalled his later life with emphysema. Completely on a whim Art Toppling Tobacco , a competition/project that seeks the resources of art to do damage to the tobacco industry was born.